The Panasonic UF-590 is a multifunction document centre that is small enough to fit on your desktop right alongside your workstation and its other peripherals. But it is also powerful enough to serve as the print hub for a small or even medium-sized office. In addition to being a fully functional laser printer, the UF-590 operates admirably as both a fax machine and a scanner. And by design, it connects to both your computer network and your phone system with relative ease. The Panasonic UF-590 is stylish, lightweight and compact. The backend of the device is noticeably higher than the front, which gives the unit excellent stability. The front panel of the UF-590 is its control board, which includes an LCD display, a keyboard and an array of convenient buttons. All common features are accessible right from the touchpad, and then are plenty of more obscure features that you can access via navigating the menu system. Programmable buttons allow you to assign features to them so that you do not have to access the menu system continually for a routine task. The biggest advantage to the UF-590 is its multifunctional nature. Few devices manage to meet the needs of the small office in a compact, affordable model the way Panasonic does here. More importantly, the print and fax/scan quality are extremely high quality. By default, the machine prints faxes and scans at a lesser quality to save Panasonic UF-590 toner, but you can change that, once or on a per use basis. 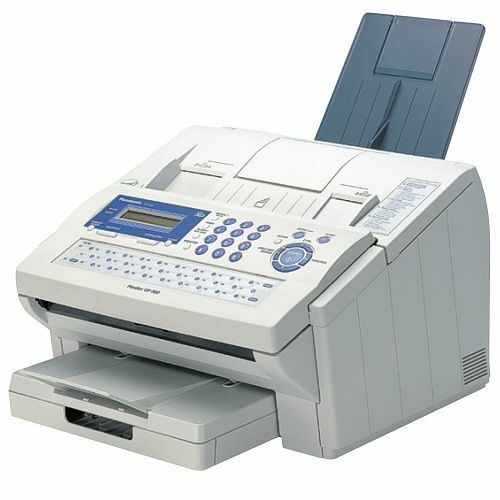 The UF-590 has also two distinct feeds, one for the printer and one for use by the fax and scan. This is particularly convenient if you use multi sheet paper. In Windows, and other operating systems, the components are accessible independently so that you can configure print, fax and scan separately. The UF-590's most prominent disadvantage is the size of the LCD screen, which is perfectly fine for phone calls and simple print jobs. But this is a printer with a slew of features. So when you have to dig for one, program a key or set up a complex job, the small size of the readout falls short. To be fair, with a more advanced LCD display, this would be a far more expensive unit. So at is, the UF-590 is perfect for the small office or home office that needs the option of doing it all but usually just performs simple print, fax and scan jobs.